Schedule effective as of September 25/26, 2018. At beginner level students will develop an efficient technique for Right Hand Flatpicking and proper Left Hand Posture. They will develop a sense of rhythm and begin learning how to read simple melodies and eventually chords in the Open Position. The goal is to couple up students to playing popular songs together and having fun. Piano Keyboard Lab with our teachers Joseph Hsieh (Tuesdays) and Phyllis Coulter (Wednesdays) teaches piano keyboard skills (beginner to Grade 5 Conservatory level) using portable keyboards and proven method books. Students receive class instruction and individual attention. Each student will have a keyboard for work during class. Our Music and Movement Class is an Orff-based approach to explore the elements of music through singing and playing Orff and percussion instruments. Children will enjoy learning traditional songs from Brazil, Columbia and Canada. 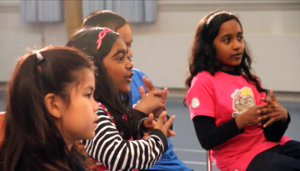 Musical games involving both movement and body percussion nurture each child’s creative capacity. 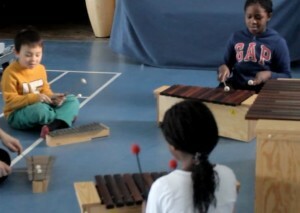 Students will learn to play accompaniments on both the hand drums and xylophones , which involve mallets. This approach will develop each students’ technical, listening and collaborative skills. This class focuses on beginner/intermediate level musical concepts and skills and songs. Students will learn a variety of repertoire, including rounds, popular and traditional songs. This class will incorporate beginner/intermediate music theory concepts, sight singing skill building, and circle games that would focus on rhythm, listening and cooperation. Each student will have a binder that will include theory homework, warm-ups, songs and sight singing sheets. In the Beginner Hand Drumming class students will learn about the origins of the instrument, how a drum is built and how to produce different sounds on it. 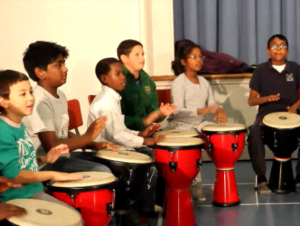 Using exercises like “Call-and-respond” they will be introduced to basic rhythmic theory and group playing. Students will acquire fundamental musical skills, such as listening and keeping steady time. 20 and 30-minute private piano lessons taught by qualified teachers. Preparation for Conservatory exams on request. 20 and 30-minute private lessons. Beginners start with open position, and learn one string at a time. 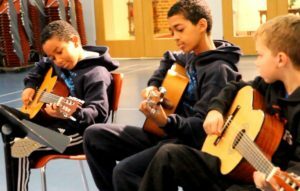 Students are introduced to note reading and apply open position notes, open position chords and strumming patterns. With these basic materials students begin learning songs and progress at their own pace in a variety of styles from folk and classical to pop and rock .